Robbing a train had seemed like such a great idea at the time. You had your plan all figured out: charge into the next carriage, punch the guy in the ridiculously impractical white stetson, grab some shiny loot, climb up onto the carriage roof and escape in generally awesome fashion. Bursting into the carriage, you found stetson-guy already holding the shiny loot. Before you could punch him in his stupid smug face he was already halfway out of the window, making his escape to the roof. He'd cleaned the place out, so you had nothing to do but stand there looking confused as the door opposite slammed open to reveal an angry looking marshal with a gun, which he wasted no time in firing at you. It's a cute 3-dimensional cardboard train! The setup looks like so much fun even before you get to play and it's bound to get people talking. Also scattered liberally throughout the train are little bags of treasure and big shiny gems, all carelessly unattended. The player with the highest value stash of loot at the end of the game is the winner, so take everything you can! Each character has a special power to help them out in the game, making them all a little bit different to play. Everyone gets their own stack of bullet cards to 'fire', a deck of action cards and a cowboy meeple in their corresponding colour. The train journey is broken up into five parts, represented by round cards drawn at the beginning of the game. Each round card tells you how many actions you'll get in the round and any special conditions for those actions. At the beginning of each round, every player shuffles their deck of action cards and draws six cards to form their hand. Players take it in turns to choose an action card from their hand to play into a central pile. You can choose to move along the train, climb up or down between the carriage and the roof, pick up loot, move the Marshal, punch or shoot. If you successfully shoot at someone, you give them one of your bullet cards to add to their deck. This means that when they draw a hand in future turns there's a chance it could be filled with useless bullets instead of helpful actions. I love this mechanic. It's really clever and so in keeping with the theme - the more you've been shot, the slower you get. If this happens to your hand (or if you just don't like the cards you've drawn), you can choose to skip an action and take 3 more cards from your deck to continue the round with. Whoever's used the most bullets at the end of the game gets a $1,000 'Gunslinger' bonus to their loot total, so fire away! Getting punched isn't too fun either - it makes you drop a piece of your loot and physically shoves you one carriage further down the train, potentially throwing out future moves for the round. The round card might tell you to play your cards face-up (as normal), face-down (as you go through a tunnel) or two at a time (as the train speeds up) - everything is shown with symbols on the round card that are nicely explained on a reference page at the back of the rules. Once everyone has played as many actions as indicated on the round card, this phase ends. Taking the central pile of cards and turning it over, the actions played in the Schemin' phase are performed one at a time in the order that they were laid. This is where chaos ensues as other people's moves start to ruin your carefully laid plans. There's an awful lot of punching thin air, shooting at an empty carriage or picking up loot that doesn't exist and this is where a lot of the fun comes from - when things go completely, hilariously wrong. Once all the actions are resolved, any special events shown on the round card take place. The round then ends and a new round card is turned over. After five rounds the journey comes to an end. Everyone adds up the loot they've collected and the Gunslinger bonus is awarded. The richest player wins! 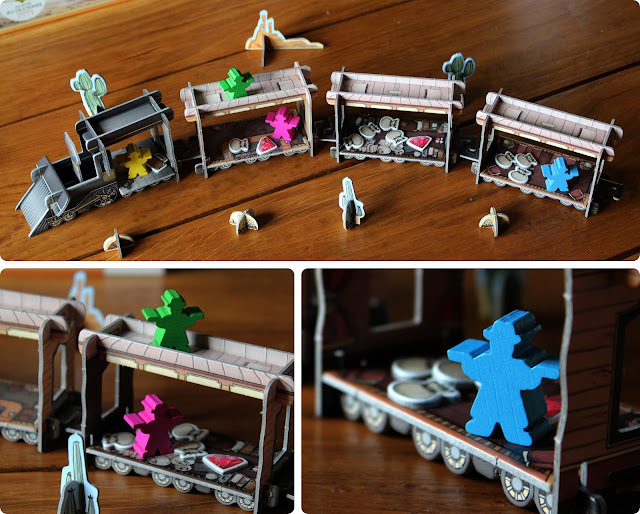 Colt Express won the Spiel de Jahres award last year, and I can completely see why. It's a really fun game to play with friends or family and always has lots of potential for laughs. If you need to have control over everything that's going on this might not be the game for you, though, as however much you think about your moves you can never fully account for everyone else's actions. If you're happy to sit back, take your best guess and have fun though, this is well worth your time. It's a light game and plays in around 30-40 minutes for 2-6 players. We've played up to five and I definitely enjoyed it more with higher player counts - it doesn't slow the game down much but the increased silliness adds to the fun for me. The game doesn't really scale down to two players; instead you have to use a special variant where you each play as a team of two bandits. The components are lovely, with the star of the show obviously being the train itself. The locomotive comes with six carriages which is what you need to play with the maximum player count, and they're all made from sturdy card that fits together really well. Assembly for the first game takes a while, so make sure you have it all built before game night! Jordi Valbuena's artwork and little details like the cardboard scenery (including skulls, rocks and cacti) all help add to the brilliant theme of the game. It all fits nicely into the well designed box insert (you don't have to take anything apart in between games), although there's not a lot of room in there for future expansions. If I have any complaints about the components, it would be nice if the carriages were a little bigger - adult hands have a habit of knocking things over when trying to move their meeples or grab some treasure. Publishers Ludonaute do have an amazing oversized version of Colt Express but I think it might just be for demonstration purposes! Look familiar? Can't wait to try that out! Thanks to Esdevium for sending me a copy of Colt Express to play. 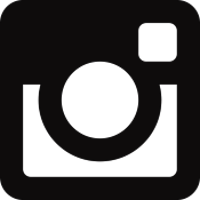 If you enjoyed this review perhaps you could take a look at my Facebook page and leave a like or come and say hello on my Instagram feed!